I was browsing the UWM website, as I often do, and found this photo. The sign for the "C. L. Dance Hall" intrigued me and I tried to identify the location of the shot. The photo is from 1937-1941. The church in the shot is easily recognizable as the Moore Church on Tibet Rd, and the crown of the building at the left edge is the Sun Co. Department Store. Therefore the facades in the center of the shot are at Tibet Rd, the section between Hankou Rd and Fuzhou Rd. The buildings facing Tibet Rd offered entertainment. 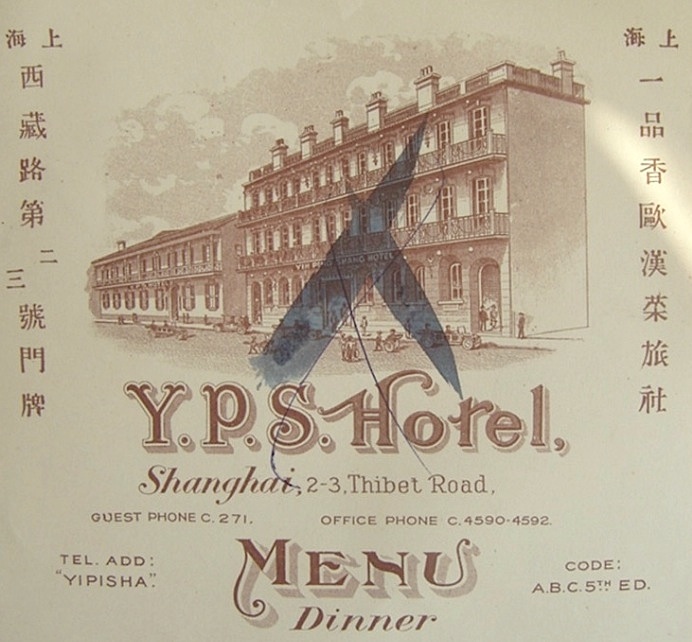 The building on the left is the restaurant Yipinxiang 一品香, the most popular Chinese-run Western-style restaurant in Shanghai since the 1880s. Below is the printed ad from an online auction that gives a closer view of the building. 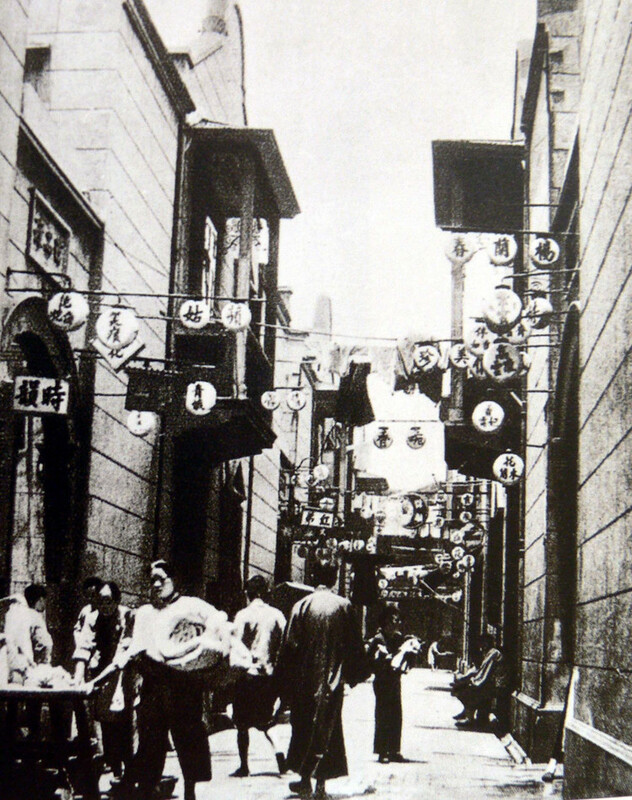 The building in the center of the shot is Juelu Fandian 爵禄饭店 ("Nobility Restaurant") that also had a dance floor. "C. L." on top of the building appears to be an abbreviation for "Chueh Lu" (old spelling). Practically cut off by the right edge of the shot is a gate to a lane compound. The sign above the gate has "192..." over it, and quite a number of people, mostly women, are seen walking in and out. Beyond that entrance, the whole block was occupied by the most notorious brothel quarter in all of Shanghai, called Huileli 会乐里. Shikumen compounds [...] – best known of all and perhaps most appropriately named – Huile Li (Alley of Joint Pleasure), were full of brothels. Huile Li, a compound of 14,500 square feet (4,420 square meters) originally built at the end of the nineteenth century, boasted a main alleyway 15 feet (4.6 meters) wide and about 280 feet (85 meters) long, four branch alleyways, and, after a remodel in 1924, twenty-eight three-bay, two-wing shikumen houses.The compound was built in a moderately tasteful style: each house had a spacious front courtyard, those houses facing the main alleyway had a balcony, and arches stood at the main entrance as well as at the entrances of branch alleys, with stone inscriptions indicating the direction and number of the branches (such as "East first Branch Alley," "West Second Branch Alley," etc.). 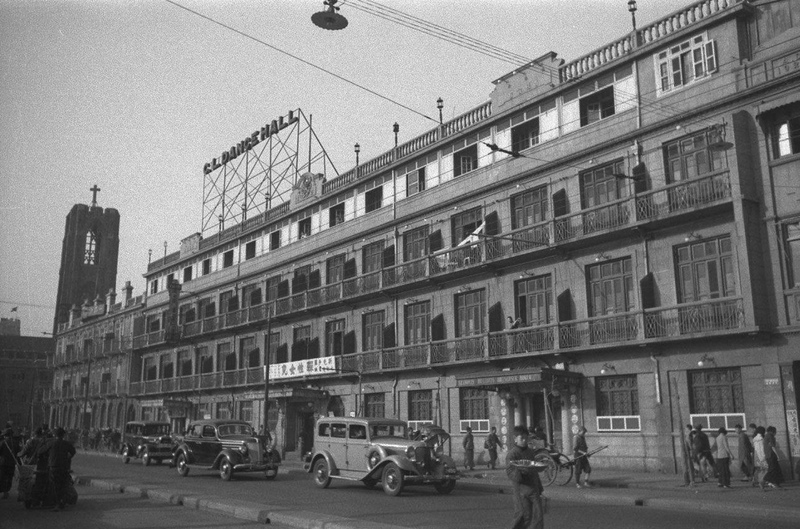 Although it was not deliberately built to accommodate brothels, by the late 1920s the compound had become a favorite site for Shanghai's higher-class prostitution. 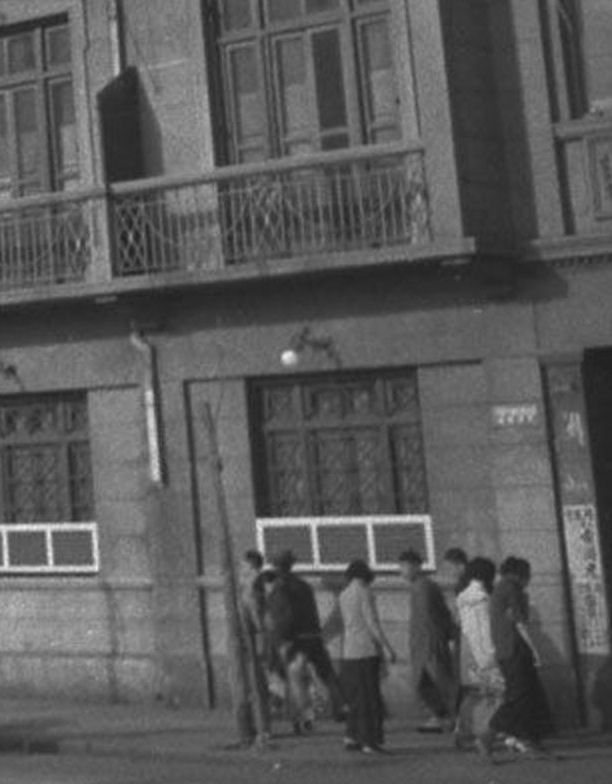 By 1949, twenty-seven of the houses in Huile Li functioned all or in part as brothels; the only house that was not a brothel was a pharmacy, which perhaps primarily served those suffering from sexually transmitted diseases. 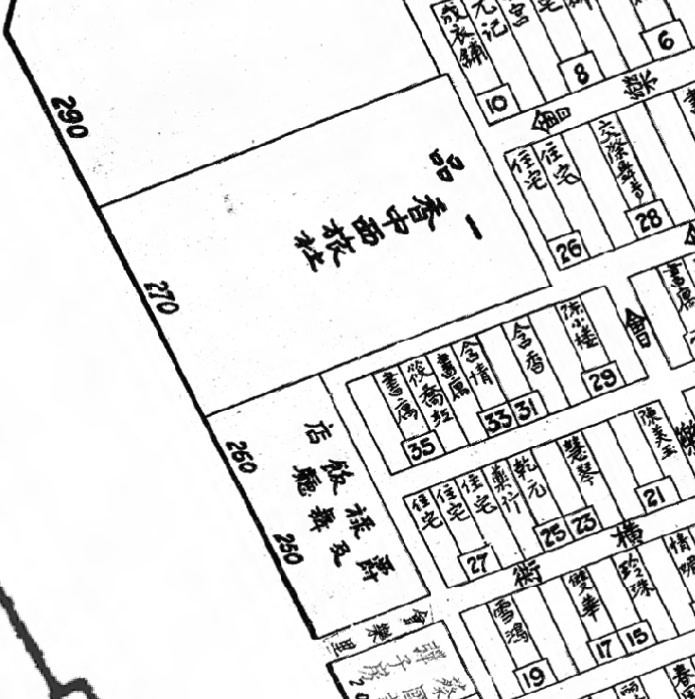 This shikumen compound was so well known for its prostitution that the name Huile Li was virtually a synonym in Shanghai for "whoring." So at the time of the photograph this was an active red light quarter containing one fifth of all the brothels in Shanghai. All of them were closed in 1951, but even in 1958 some of the reformed prostitutes were reported to go back to the old ways. 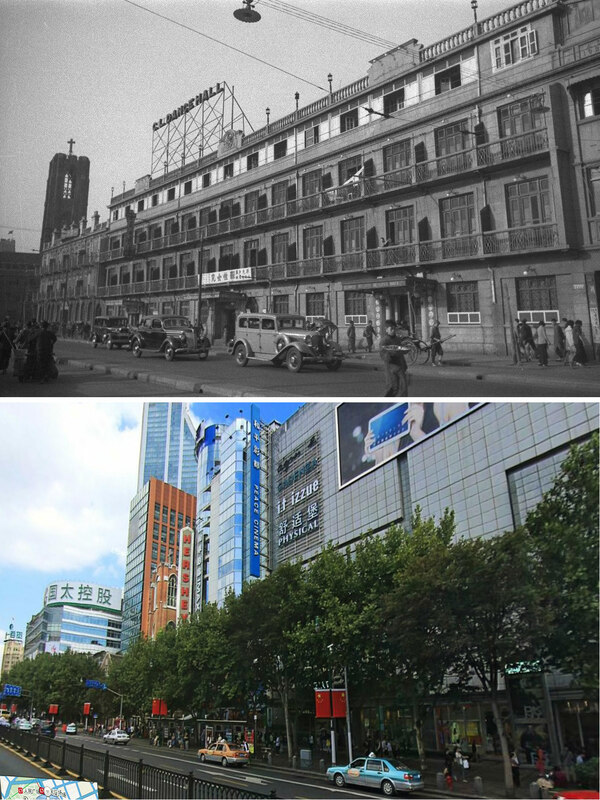 Huileli was demolished in the late 1990s, perhaps because of its reputation, and today the block is occupied by the Raffles City and Peace Cinema; the only landmarks that are still recognizable from that photograph are the Moore Church and the Sun Co store (now Shanghai No. 1 Department Store).